To mark Te Epetoma o te Reo Māori Kūki ‘Airani, Cook Islands Language Week, we have a special behind the scenes post today. This year is also particularly significant as today, 4 August, marks the fiftieth anniversary of the Cook Islands achieving self-government. 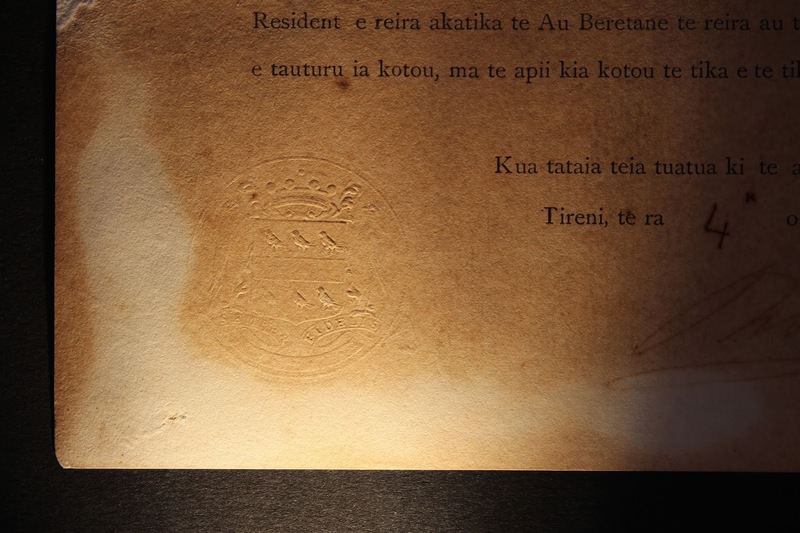 Last year David Ashman, the Preservation Manager at Auckland Libraries, performed conservation treatment work on The Cook Islands Proclamation (E Tuatua Akakite) of 1891. This was reported on earlier this year in both the Cook Islands News and the Cook Islands Herald as well as on the website of the Cook Islands Museum and Library Society. A fragile and rare, one-paged document written in Maori, the language spoken by most of the population of the Cook Islands at that time, called the Proclamation (E Tutatua Akakite), signed by the Earl of Onslow, on 4th April, 1891, on behalf of the Queen of Great Britain & Ireland, placing a protectorate over the Cook Islands. This document marks the beginning of a relationship, which continues today with the Queen as the Head of State of the Cook Islands through the Governor General of New Zealand and the Cook Islands inheriting a Westminster parliamentary system. The process began by first removing the document from its highly acidic backing board, to which it had been attached over 60 years ago. Ref: Backing removal of E Tuatua Akakite, 2014. Then the document was deacidified by soaking in an aqueous solution. Ref: Washing and deacidifying of E Tuatua Akakite, 2014. Tears and losses were repaired using a fine tissue paper and freshly made starch paste. Ref: Tear repair and fills for E Tuatua Akakite, 2014. To remove surface dirt and dust the document was lightly cleaned with a soft brush and conservation grade eraser. Ref: Dry cleaning of E Tuatua Akakite, 2014. When all conservation work was finished the debossed seal appeared more visible. Ref: Debossed seal of E Tuatua Akakite, 2014. If you have enjoyed this behind the scenes look at library preservation be sure to follow Auckland Libraries Instagram account (@auckland_libs) as the Preservation team often posts photos of other library conservation projects there. To help celebrate Te Epetoma o te Reo Māori Kūki ‘Airani there are plenty of events on around Auckland Libraries this week. Also for more on the Cook Islands have a look at some of Auckland Libraries' historical photographs of the Cook Islands in our post from two years ago.